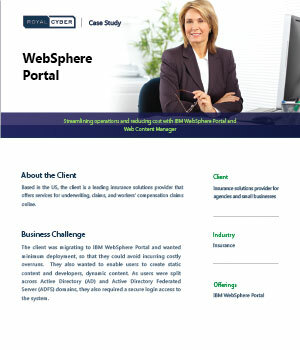 To create custom applications for two sets of users, we crafted a comprehensive online insurance portal using IBM WebSphere Portal and Web Content Manager. We leveraged WebSphere Portal&rsquo;s Security Assertion Markup Language (SAML) security features to create user logins for the AD and ADFS domains through a transient user setup process. Using SAML is the best approach for securing applications, especially when a migration is underway. Moreover, configuration was hassle-free because only minimal or zero user settings were needed during the configuration phase.